Factory for virtual machine related commands. Definition at line 30 of file cmd.h. vm Initialized virtual machine object to create commands for. Definition at line 32 of file cmd.h. Definition at line 284 of file cmd.cc. Definition at line 288 of file cmd.cc. Definition at line 292 of file cmd.cc. 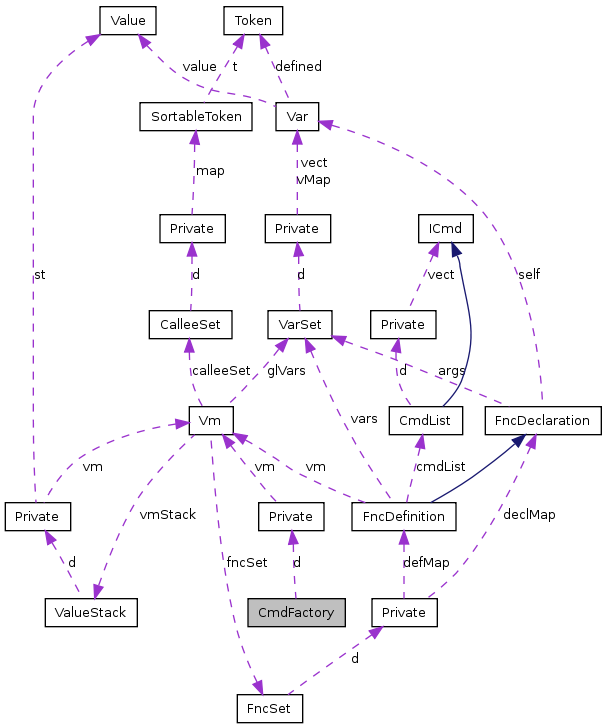 References FncDeclaration::args, d, StreamDecorator::E_ERROR, ETOKEN_ID, Vm::fileName, Vm::glVars, Var::name, FncDeclaration::self, Token::text, Value::type, Token::type, Value::V_NULL, Var::value, FncDefinition::vars, and CmdFactory::Private::vm. Definition at line 398 of file cmd.cc. Definition at line 402 of file cmd.cc. Definition at line 336 of file cmd.cc. References FncDeclaration::args, ValueFactory::create(), d, StreamDecorator::E_ERROR, ETOKEN_ID, ETOKEN_NUMBER_DOUBLE, ETOKEN_NUMBER_INT, ETOKEN_STRING, Vm::fileName, Vm::glVars, Var::name, Token::numberDouble, Token::numberInt, FncDeclaration::self, Token::text, Value::type, Token::type, Var::used, Value::V_DOUBLE, Value::V_INT, Value::V_NULL, Value::V_STRING, Var::value, FncDefinition::vars, and CmdFactory::Private::vm. Definition at line 406 of file cmd.cc. References d, StreamDecorator::E_ERROR, ETOKEN_KW_NOT, ETOKEN_OP_MINUS, Vm::fileName, Token::type, and CmdFactory::Private::vm. Definition at line 417 of file cmd.cc. References d, StreamDecorator::E_ERROR, ETOKEN_KW_AND, ETOKEN_KW_DIV, ETOKEN_KW_EQ, ETOKEN_KW_NEQ, ETOKEN_KW_OR, ETOKEN_OP_GREATER, ETOKEN_OP_GREATER_EQ, ETOKEN_OP_LESS, ETOKEN_OP_LESS_EQ, ETOKEN_OP_MINUS, ETOKEN_OP_PLUS, ETOKEN_OP_SLASH, ETOKEN_OP_STAR, Vm::fileName, SHARED_PTR, Token::type, Value::V_BOOL, Value::V_DOUBLE, Value::V_INT, Value::V_NULL, Value::V_STRING, and CmdFactory::Private::vm. Definition at line 487 of file cmd.cc. Referenced by Builder::fncCall(), and VmRunner::Private::run(). Definition at line 491 of file cmd.cc. References d, StreamDecorator::E_ERROR, ETOKEN_KW_DOUBLE, ETOKEN_KW_INT, ETOKEN_KW_STRING, Vm::fileName, Value::V_DOUBLE, Value::V_INT, Value::V_STRING, and CmdFactory::Private::vm. Definition at line 511 of file cmd.cc. Definition at line 48 of file cmd.h. Referenced by createAssign(), createBinary(), createPrint(), createPush(), createUnary(), and ~CmdFactory().